As I keep saying: the status quo has divested the working and middle classes. 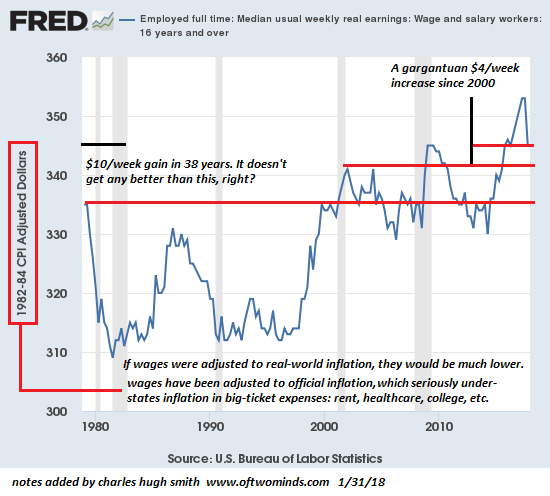 The reason why the status quo has failed and is fragmenting is displayed in these three charts of wages, employment and assets: wage earners (labor) are in a rowboat trying to catch the yacht of those who own assets (capital). Here is a chart of weekly wages of those employed fulltime: up a gargantuan $4/week in the 18 years since 2000. Let’s see, $4 times 52 week a year–by golly, that’s a whole $208 a year. Brand new Ford F-150, here we come! If we go back 38 years to 1980–an entire lifetime of work–we find real (adjusted for official inflation, which seriously understates big-ticket expenses such as rent, healthcare and college tuition/fees) wages have notched higher by $10/week–a gain of $500 annually. If we adjusted wages by real-world income, we’d find wages have declined since 1980 and 2000. Here’s employment by age group since the year 2000. 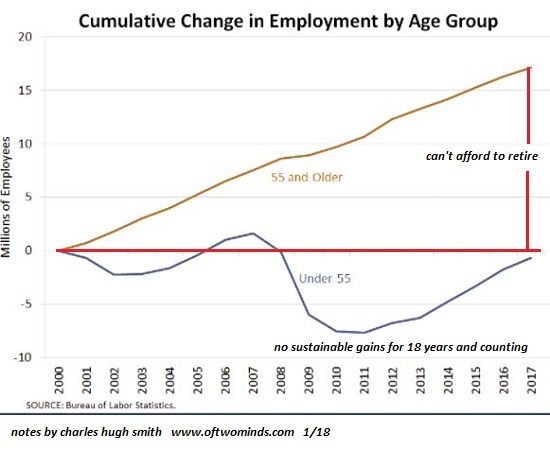 THose who can’t afford to retire are still dragging their tired old bones to work while employment for the under-55 cohort hasn’t even returned to the levels of 2000. Meanwhile, asset valuations have soared. Those who own capital (assets) have done very, very well, those who trade their labor for dollars–they’ve gone nowhere. Households with two regular jobs could afford to buy a house in Seattle, Brooklyn, or the San Francisco Bay Area in 1995. By 2005, they were priced out. Can a household with median income ($59,000 annually) afford a crumbling shack in any of the white-hot housing markets? You’re joking, right? The cold reality is wage-earners are tugging on the oars of a water-logged rowboat, trying to catch up with the sleek yacht of asset owners. The system has been rigged to reward those who own assets (capital) or who can borrow immense sums of nearly-free money (credit) to buy assets. Can we be bluntly unpolitically correct for a moment and observe that the rowboat is never going to catch the yacht? No wonder the nation’s savings rate is near-zero; most households don’t earn enough to save much, and those that do are caught up in a nightmarish Red Queen’s Race in which they save $10,000 a year but the asset they hoped to buy rose by $50,000. In other words, trying to save enough by pulling on the oars of a rowboat for 10 years while the yacht has accelerated and is now on the dim horizon is a fool’s game. As I keep saying: the status quo has divested the working and middle classes. The laboring classes have no stake in America’s status quo except their entitlements and whatever assets they bought 20+ years ago around 1994-97. 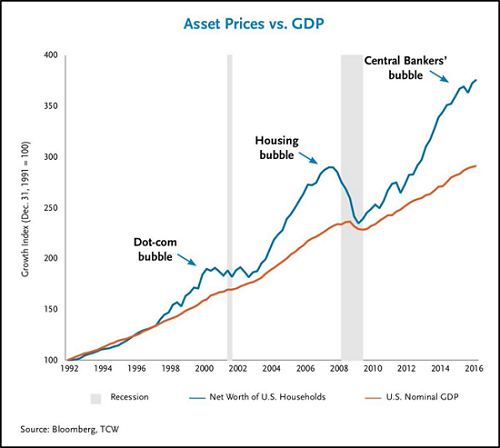 Those who weren’t able to buy assets 20 years ago have been in the wallowing rowboat watching the yacht pull farther away every day. Even households making double or triple the median annual income ($120,000 to $180,000) are struggling to keep up in high-cost regions. This reality is driving social discord that will morph into social disorder. Next Next post: DACA… CACA… Or NADA…?